Hong Kong - Irish great Brian O'Driscoll said on Thursday that it was officiating and not the laws of the game that needed to change to ensure a spectacle of scintillating rugby at this year's Rugby World Cup in England. All Blacks coach Steve Hansen had said last week that defence was dominating and warned the 15-a-side game risked becoming "boring" unless a rulebook running to more than 200 pages was culled and de-mystified. 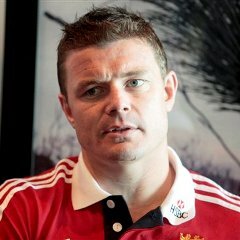 But O'Driscoll, who retired last year after a record 141 Test caps - 133 for Ireland and eight for the British and Irish Lions - disagreed. "I'm against changing it (the rules). Part of the issue is that there's different interpretations between the hemispheres," he said on the sidelines of the HSBC Hong Kong Sevens Rugby Festival before taking a coaching session with 130 schoolchildren. "Be it north or south, referees look at things slightly differently and rule things differently. All the players want is consistency." He cited the Six Nations finale last weekend as proof that rugby at its best remained an amazing spectacle. In three matches 221 points were scored to see Ireland crowned champions on points difference from England and Wales. "England being able to push Ireland as close as they did, and even Ireland going and scoring 40 points at Murrayfield off the back of a huge result for Wales in Italy, you couldn't script that. It was real edge-of-the-seat stuff," said the former centre. He added that the astonishing day might have caused a few southern hemisphere coaches to sit up and take note before the World Cup kicks off in England on September 18. "Other than the last weekend it wasn't the best Six Nations, but what it did do is remind us in the northern hemisphere what we are capable of doing. "To see three games of that strength in depth and that magnitude, I would imagine that some of the southern hemisphere teams looked on and paid some attention." The last time O'Driscoll visited Hong Kong was as a member of the 2013 British and Irish Lions squad that played the Barbarians in the city as a warm-up for their victorious tour of Australia. He was pleased to be returning to the same Hong Kong Football Stadium, but this time to experience the unique party atmosphere of the Sevens generated by a packed, and often raucous, 40 000 capacity crowd. "Never, unfortunately, got the opportunity to come here and play the Sevens," said the Irishman, referring to this year's 40th edition of the tournament, which kicks off on Friday and finishes Sunday. "I'm looking forward to seeing what it's like. I've heard so many great things about the Sevens."